Posted in John Edwards, Scandals. 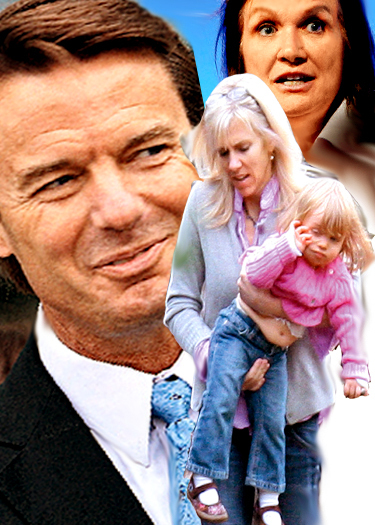 Tags: John Edwards, Rielle Hunter. RSS feed for comments on this post.. TrackBack URL. Hmmm, that’s a very interesting way that Rielle Hunter is carrying her daughter …. I wonder if John Edwards tought her that hold?? Poor little girl, being raised up with parents like that. For sure, these two looney birds are made for each other. Can you imagine if this slimeball had become PotUS or VicePotUS?? What a First Lady Rielle would make! I am a resident of NC and I knew Edwards was a sleaze when he ran for senator. Couldn’t the people of the US see through his unctuous grin? I had been blogging about how sleazy a politician he is starting well before the Rielle Hunter story broke. While a few liberal bloggers agreed back then, it took the scandal for most people to really see through him.